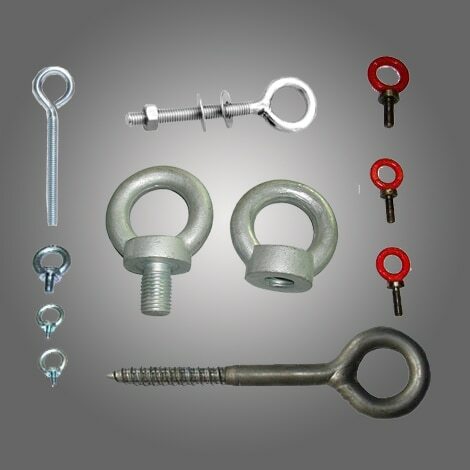 Our organization is engaged in exporting and importing a wide range of LIFTING EYE BOLTS that is available in various shapes, sizes and thicknesses. These bolts are provided with a loop and thread on one end, which enable instant attachment of a string to the back of the object. Designed to perfection, these LIFTING EYE BOLTS have gained wide appreciation for resistance to corrosion and long functionality. Our range of LIFTING EYE BOLTS is available in both standard and customized dimensions as required by our clients. These attributes make our range find applications is steel, cement, pesticides, general piping, constructions, and other engineering related industries. We provides our range of LIFTING EYE BOLTS in packs of various size as required by our clients in quality packaging material to avoid any damage.